President Donald Trump’s name has been slapped on yet another organization. But unlike Trump Hotels, Trump Steaks and Trump Vodka, money invested in “Trump Forest” won’t land in his piggy bank. In April, three environmental activists in New Zealand launched the global reforestation project in an effort to counteract negative effects caused by the Trump administration’s dismantling of Obama-era climate policy. Dr. Daniel Price, Adrien Taylor and Jeff Willis, all in their 20s, said they felt compelled to act after Trump signed an executive order in March that essentially prioritized the fossil fuel industry over the environment. “We wanted something tangible that people could do that would actually have a physical impact on what the U.S. government is doing,” Price, a climate scientist and glaciologist, told HuffPost. Under the Trump administration, U.S. commitment to combating man-made global warming by reducing carbon emission has suffered major setbacks. During his first six months in office, Trump appointed fellow climate change skeptic Scott Pruitt to lead the Environmental Protection Agency, reduced regulations on coal development, and pulled out of the Paris Agreement, a landmark international climate action pact. “[It’s a] systematic dismantling of U.S. climate policy at a time when it’s absolutely critical that we start accelerating our efforts on climate change,” Price said. The goal is for “Trump Forest” to grow so large that it can offset additional carbon released into the atmosphere should the White House roll back the Clean Power Plan, legislation enacted under the Obama administration to combat global warming. To hit that target, Price said over 110 billion trees, covering an area roughly the size of Kentucky, would need to be donated. It’s a lofty goal, Price said, but it’s not their only one. Aside from planting trees, Price said he hoped individuals involved in the project would gain a greater understanding about climate change, one of the most pressing problems facing the planet. The “forest” itself is not based in one specific location. 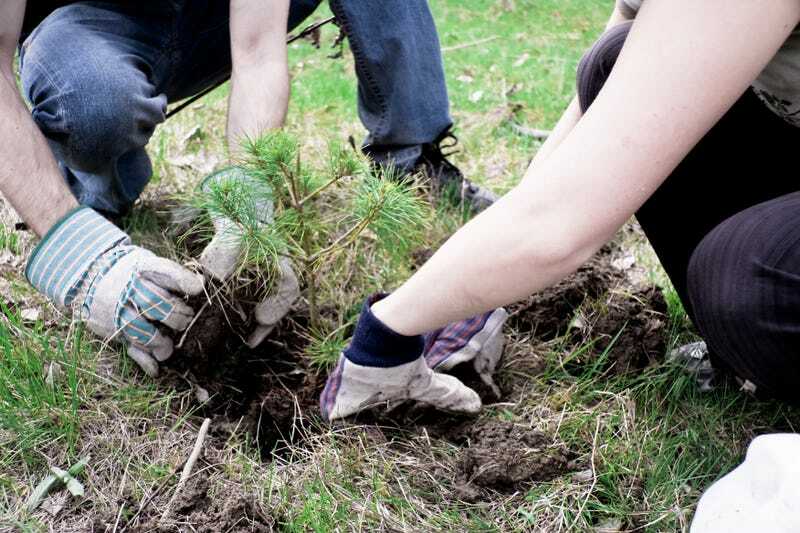 Instead, participants can use the project’s website to either donate to Eden Reforestation Projects, a charity that will use the money to plant trees in Madagascar, or make a donation in Trump’s name to a local tree-planting organization. This week, the number of trees pledged to “Trump Forest” surpassed the 50,000 mark. To help move the project forward, Price said the group is hoping to attract major corporate sponsorship, though they’ve had some trouble convincing companies that fighting climate change is an apolitical undertaking. Despite the project’s namesake, “the founders have no desire to meddle with left- or right-leaning politics; their only goal is to call out — and offset — climate ignorance,” according to a “Trump Forest” press release. “When faced with monumental stupidity, you have to fight back with monumental collective action,” Price added. To learn more about taking action with “Trump Forest,” click here. This story was originally published by HuffPost and is reproduced here as part of Climate Desk.